Some friends and I went on an excursion the other day, and I wanted to share a few photos. It is always fun to go with someone when they see a place for the first time. Our first stop was the Macho de Monte river canyon. Today we were surprised to see a couple guys from the USA training the Panamanian solders on search and rescue operations. This guy was big, tattooed, and looked very very strong. We could see the guys down in the canyon dangling on their ropes. Next stop was the finca (farm) to look around, and pick up Cedo for the rest of our day. Since I was there, I wasn’t going to pass on the opportunity to get plantain leaves for tamales. This is the little calf who was so sick and looked like skin an bones. She is looking great now. Meet the newest addition to the farm, the little boy calf who was born about a week ago. He wasn’t so sure about being petted, but he felt so soft and silky. I was so happy to see the calves looking healthy and happy! Last time I was at the farm, this black cow was hanging out with the other calves awaiting her time. Since both the mother and calf were lost in the last birth, it was wonderful news to see all went well this time. The mother also looks good and has rejoined the group of cows being milked. Cedo explained that the calves are taken away at 3 days of age or otherwise the mother gets too used to them nursing and doesn’t want to accept the milking machine. The calf is still fed the mother’s milk, but by bottle. After we were finished at the farm we went on to Volcan and Cerro Punto to see the vegetables growing on the sides of the mountains, and then stopped for a bit of lunch. Our last stop was the Jensen Coffee Farm. My friends love their coffee and wanted to buy some. The perfect end to a great day was sitting on their terrace sipping coffee or hot chocolate, and enjoying the fabulous scenery in front of us. It changed by the minute as the clouds moved through, but I did manage to narrow my choices down to these four photos. We are so fortunate to live in this beautiful country! 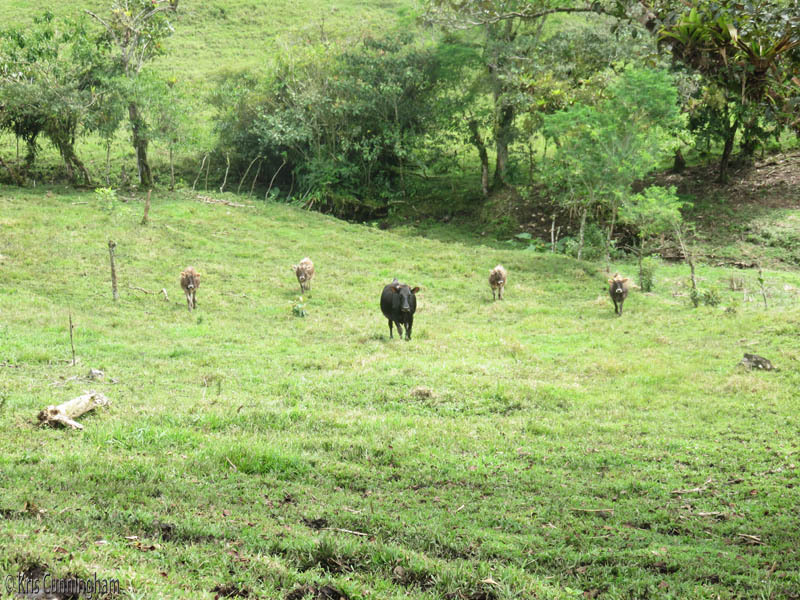 This entry was posted in Exploring the Area, photography and tagged calves, Cattle, Chiriqui, farm, finca, Jensen Coffee Farm, Macho de Monte, Panama, search and rescue operations, Volcan. Bookmark the permalink. It is very Beautiful and your photos show the Beauty that some may never see. Absolutely gorgeous! Sounds like a wonderfully relaxing day! It is such a beautiful country! I’m glad you enjoyed the pictures and yes, it was a great day. Wonderful…can’t wait to get there! May 1st cannot come soon enough. Every day is a day closer!